Although Pharaoh Hatshepsut’s stunning temple is the most well-known structure at Deir-el-Bahri, the site also includes two other temples. These temples were dedicated to the worship of the pharaohs who built them, a place where offerings and prayers could be made to them. 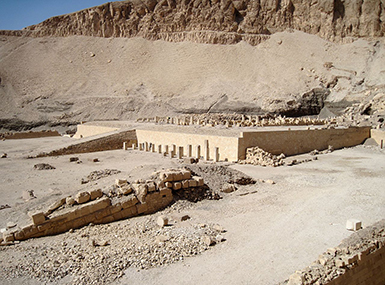 The oldest temple at the site is the Eleventh Dynasty temple of Mentuhotep II (reigned ca. 2040-1991 BCE), the pharaoh who re-united Egypt at the beginning of the Middle Kingdom period. His tomb is the earliest mortuary temple showing the pharaoh enacting ceremonies for the deities instead of just receiving offerings from them. The temple also identifies the pharaoh with Osiris, a local Theban deity who grew in importance from then on. Image: Deir-el-Bahri with Hatsheptut’s Temple, Temple of Thutmoses III and Mentuhotep II, West Thebes, Egypt. Taken by Nowic (Wikimedia). David, Anthony and Rosalie. A Biographical Dictionary of Ancient Egypt. London: Taylor & Francis, 1992. DK Publishing. DK Eyewitness Travel Guide to Egypt. London: Dorling Kindersley, 2003. Lehner, Mark and Richard H. Wilkinson. The Complete Pyramids: Solving the Ancient Mysteries. London: Thames & Hudson, 1997. Shafer, Byron Esely (Editor), Temples of Ancient Egypt, Cornell University Press, 1997.